Starting Indoors: Sow indoors 3-4 weeks before planting out into warm soil. Water from the bottom up and keep at 70-90°F. Starting Outdoors: Direct sow after last frost into warm soil. Thin to 1-1.5' apart if sown in rows. If sown in hills, sow 5-6 seeds per hill, about 3' apart; thin to best 2-3 seedlings. 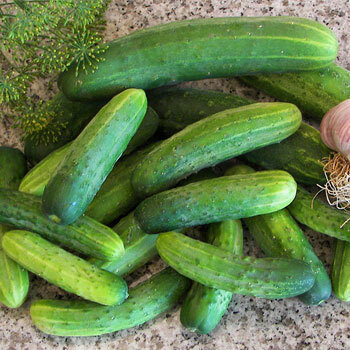 Cucumber plants do best in full in in loose soil that is rich, moist, and well-drained. Space 1-1.5' apart if sown in rows. If sown in hills, sow 5-6 seeds per hill, with hills about 3' apart; thin to best 2-3 seedlings. Watering Details: Provide about an inch or so of water per week, more during especially dry spells. Do not allow to dry out or get soggy. Fertilizer: Scratch in a couple of inches of compost or well-rotted manure prior to planting. Additional applications of liquid or granular fertilizer (preferably organic) can also be applied according to package instructions. Diseases & Pests: Cucumber beetles can be troublesome. Prevent by removing debris from the garden in the fall to reduce overwintering sites. Also manage for beneficial insects, such as ladybugs, green lacewings, and soldier bugs, as they will feed on the cucumber beetle eggs. Floating row covers and straw mulch are also very helpful, as they discourage movement from plant to plant. Try to hand pick beetles and put them in a bucket of soapy water. Squash bugs can be deterred by applying neem oil regularly, removing egg masses from leaves, and encouraging beneficial insects by planting flowers nearby that will help attract them. Remove debris in the fall to prevent overwintering. An organic pesticide may be necessary. Plant: Bushy green plants with somewhat prickly leaves and stems. Flowering: Yellow flowers about 1" wide. Seeds: Seeds can be found inside the cucumbers. Cucumber plants are generally monoecious, meaning they have male and female flowers (imperfect).